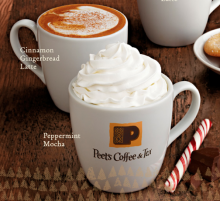 Peet’s Coffee & Tea: FREE coffee day December 24th! Head over to Peet’s Coffee & Tea on Saturday, December 24th. They will serve complimentary brewed coffee and tea all day as a way to “thank you” for supporting their communities. Make sure you check your local stores, some will be offering this freebie on Friday, December 23rd instead of Saturday. Offers Dec 22, 2011 in coffee, free, holiday, Peets · Expired! If you are heading out for Peet’s coffee today, grab this coupon for $1 off any beverage. I love that Peet’s lets you use a mobile version too so you don’t even need to print the coupon, just show your cashier and you’ll get your $1 off. With my mile long to-do list, I’ll be stopping in today! Coupons Dec 19, 2011 in coffee, Peets · Expired! Head over to Facebook and “Like” Peet’s Coffee and Tea. You can grab a coupon for a FREE small drip coffee or an upgrade to your favorite drink. Limit one per persona at participating locations. I think we should start every Monday like this! Coupons Jun 20, 2011 in coffee, Facebook, free, Peets · Expired! If you stop at Peet’s Coffee for your morning joe, you might want to print this coupon. You can also show this coupon to the cashier from your mobile phone to get $1 off any beverage! One day only, May 2nd, Peet’s is offering $1 off any beverage. This offer is valid at participating locations. Excludes airport and supermarket locations. Coupons May 1, 2011 in coffee, Peets · Expired! If you’re a Peet’s regular this is a good one for you. Buy and beverage with a baked good and get $1 off with this Peet’s coupon. *Beverages excludes kids drinks, juice and bottled water. Offer valid June 23rd and 24th only. Coupons Jun 22, 2010 in coffee, Peets · Expired! Grab a coupon from Peet’s Coffee and Tea and get $1 off any iced beverage. What a great way to kick off summer! Offer good May 14th only. Coupons May 14, 2010 in coffee, Peets · Expired! In honor of Earth Day, Peet’s is giving customers a free medium beverage with the purchase of a featured product, tumbler, mug, or glass. Visit Peet’s for more information and to see their Every Day-Earth Friendly offers. Offers Apr 22, 2010 in coffee, EarthDay, Peets · Expired! Peet’s is offering a great coffee deal. Visit a participating Peet’s location now through January 18th to receive a free beverage with a purchase of another beverage equal or lesser value. Take someone out for coffee this weekend, and don’t forget your Peet’s coupon! Coupons Jan 8, 2010 in coffee, free, Peets · Expired!